A lot of people come and go in our lives over the years. Some people come into our lives solely for the purpose of teaching us something and then they quickly go, while others stay around and leave footprints in our hearts. Some of them are really special to us and they stay in our lives as our best friends, and others become our perfect soul mates or life partners with whom we can cry, laugh, cuddle, and share our lives. Aries people are aggressive, resourceful, active, and very energetic people who like to live life in the fast lane. They don’t like to wait, so they need a partner who can handle their fast pace and dynamic lifestyle. The ideal soul mate for them is a confident person who’s not afraid to take risks. If the Taureans have a loyal person beside them, they will stay with that person forever. Those born under this zodiac sign need someone who will maintain their strong sense of commitment. Their ideal soul mate is a reliable person, someone whom they can trust. The Taurus can also be impressed by romantic people that have eyes only for them and make them feel special. Geminis can be very picky when it comes to romantic partners. 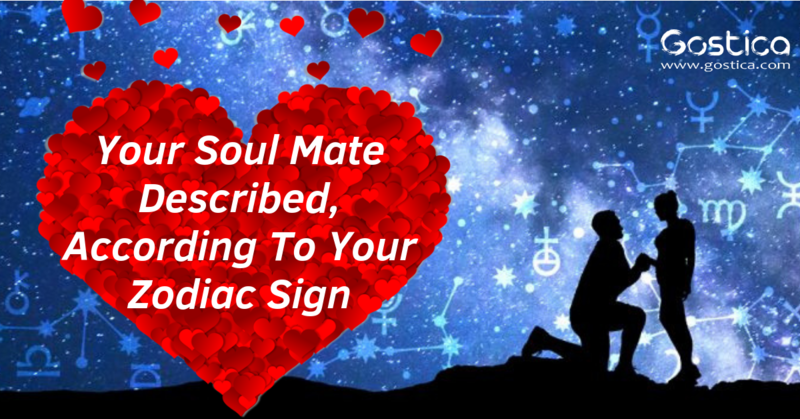 They are one of the few zodiac signs that seek love and a soul mate in one. The ideal soul mate for them is someone who is funny, clever, inspiring. Also, those born under this zodiac sign are always looking for someone who is different from them just to make their lives interesting. Cancers have big hearts and a lot of love to share. But if you want to be their friend or romantic partner, you must be ready to give, not only to receive. Cancers need someone who is intelligent and makes them feel special and loved. They are kind and rarely exhibit selfishness, so their ideal partner must also be caring. People born under this horoscope sign want a partner who loves adventures, but is also an intriguing person who constantly keeps them interested. Leos are confident and proud people who would not allow their soul mates to overshadow them, for nothing in the world. Virgo representatives are demanding in every respect, especially in love. They find it difficult to find a soul mate. Their soul mate is driven, ambitious, determined, and fully committed to their relationship.